Last week, there was a CORDEX workshop on regional climate modelling at International Centre for Theoretical Physics (ICTP), near Trieste, Italy. The CORDEX initiative, as the abbreviation ‘COordinated Regional climate Downscaling Experiment‘ suggests, tries to bring together the community of regional climate modellers. At least, this initiative has got a blessing from the World Climate Research Programme WCRP. I think the most important take-home message from the workshop is that the stake holders and end users of climate information should not look at just one simulation from global climate models, or just one downscaling method. This is very much in agreement with the recommendations from the IPCC Good Practice Guidance Paper. The main reason for this is the degree of uncertainties involved in regional climate modelling, as discussed in a previous post. I sense that the issue of uncertainty is sometimes seen as problematic and difficult to deal with. Uncertainty does not mean that we are completely clueless – it means that we do not have accurate knowledge about absolutely every detail. Uncertainty is nothing new – we live with it every day. All scientific disciplines have to live with uncertainty too. Moreover, we can describe and model uncertainty. The question about uncertainty is a question about information about processes, whether understood, random variations (known as ‘noise’ or stochastic processes), or systematic model shortcomings (biases). One way to model uncertainty. Theoretical physics have a long tradition with uncertainties – take quantum physics for example. 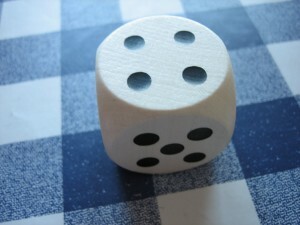 This has lead to one anecdote, where – according to Wikiquote – Albert Einstein is paraphrased to have said “God does not play dice with the universe”. Uncertainty is often modelled in statistics though stochastic models. One common phrase in statistical texts is “take a random variable X…”. I believe that statisticians can contribute more to climate sciences in better description of the uncertainties, in addition to better calibration of statistical models. And I’m not alone. In a European COST-action initiative named ‘VALUE’, spearheaded by Douglas Maraun, the intention is to include statisticians for improved climate modelling. We can get much information about all these aspects from our models and real observations (empirical data). The key words are evaluations and testing. Hence, it so important to combine models based on our understanding of the world with empirical data. Another point is the fact that general circulation models have our understanding of relevant processes encoded into lines of computer code, whereas empirical-statistical models capture all relevant processes simply by the fact that these are emedded in the data itself. The problem with statistical models is that one does not know if they actually capture the real connections, or if a good match is just a coincidence. The beauty of computer modelling is when real features are predicted, and the combination of empirical-statistical models with physics-based models enhance our confidence of actual predictive skills. IAV community – ‘IAV’ being ‘Impact, Adaptation and Vulnerability’. 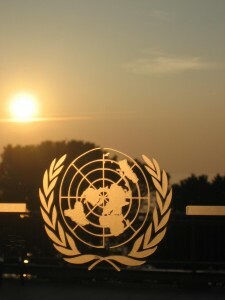 A global warming is bound to affect a great deal of earth’s population. For many people, scientific facts do not really speak loud and clear. What does model bias mean, and what implication does that have for my risk assessment? Scientific facts must also be complemented with narratives, or a story line which visualises possible outcomes. For global climate services, science and infrastructure is not enough – we also need to interpret the information into knowledge, based on science. I wonder if it is assumed that this communication work will happen effortlessly, or if people see that this will be a herculean task. Maybe we will get the answer to that at the open science conference in Denver 24-28 October this year. It still appears that some people cannot distinguish weather from climate. Local events are simply part of the larger climate and may deviate significantly on a daily basis. Using models, we see for instance that the rainfall in Brisbane was not extreme this year compared to past amount under similar oceanic conditions. The rainfall under different conditions is irrelevant for comparison sake; do we know all the unknowns? 2011 flood event inflows to the Wivenhoe Dam were 2,650 GL. Inflows to that location during the 1974 flood were 1,450 GL. In 1893 inflows to that location were 2,744 GL. The 1893 retained its perch on that metric by a measly 94 GL. From memory, just after the flood, I said I expected the 2011 flood to exceed the 1974 flood, and that it might possibly exceed the 1893 flood. My non-expert hunch came pretty close. A recent report described the 2011 flood as “unusual and rare,” and concluded it exceeded Q100. It seems that every comment page for every article on this site degenerates into pointless, repetitive “arguments” with the same handful of AGW deniers who continue their rote regurgitation of Koch-funded talking points, dishonest sophistry and long-since, many-times-over debunked falsehoods, no matter what anyone says. Commenters like Dan H. are not here to discuss or “debate” anything. They are here to copy-and-paste propaganda. They will ignore any rebuttals or refutations and continue to mechanically and repetitiously post the same propaganda over and over and over again. If you enjoy arguing with them as a form of entertainment, well, enjoy yourself. But don’t imagine that it accomplishes anything useful. The Dan H. posts look quite like a professional operation: Always ignores being caught distorting, omitting, misstating, and lying. Continues posting as though nothing had happened. Posts long calmly worded pieces that appear to take chunks from published work by scientists in the area, slightly rearrange it as though it were part of logical argument, e.g. then states talking points from the septic bucket as though they were deductions from the science rather than unrelated PR. Quite a professional job — almost credible. Likely fools many readers. JCH, (#50) you’re just making Dan’s point–the flood wasn’t that unusual, as really rare outlying events go. I’m French too, nothing wrong with that… I think. In Pakistan, a few years ago, at the time of the Kashmere earthquake, I had the honour to meet with Prof. Courtillot. I was impressed by his knowledge of all things geological. Now, when it comes to climate, and I hear about milliseconds changes in the duration of the day, cosmic rays and electrical charges of the ionosphere, ktl., all that having been checked during periods as long as 40 years…, I am lesss impressed. The weather report is the only news half the U.S. listens to (the other being Entertainment Tonight)so if we could start a little insertion of statistics . . . .
My mechanic is an old friend and I had a chat with him today. He had no trouble assimilating the information. I explained about denial and he understood that. He is mostly ignoring it because he is afraid (who wouldn’t be). I said the argument is confusing to those without scientific training, but the results are not, so just stick with that, without the limited focus used by deniers to prevent reality from sinking in. Massachusetts, while not notable for floods compared to many other locations, has had a bellyful of life-changing floods in the last few years. People notice. Weather is a key. It’s time to start using trends in weather and stop assuming the American public is stupid about it. They notice, they are just not making the connection because the deniers are busy taking advantage of scientists’ extreme care to be correct about it (having no such scruples themselves). Weather is climate over time and space. Trends are real. They are noticeable. People are not stupid. Local weather is not climate. Single weather events are not climate. Changes in weather over decades are climate. The atmosphere is more complex, but even that can be included with the likes of tornadoes and other extreme phenomena that result from increases in energy and water vapor. It should not be too difficult to convey that there is more energy in the system due to climate change. Susan Anderson #57. I want to agree with everything you say but polling shows the opposite: fewer people believe the science than did five years ago in many nations. This while the science has reduced uncertainty and shown conclusively that the situation is urgent, again. A classic example of right-wing over-bite, or just a unmitigated catastrophe? OAB: Thanks, I ignore polling. One has to start where I find myself, here amongst the “east coast elites”. My point is that scientists are being too cautious, and that it is possible to point out the connection between weather and climate rather than backing off. As the tide rises over the banks of the Channel nearby, the undoubted fact that the ocean is rising will be apparent. No amount of dissing physics will change that. I’m for accumulating the day-to-day evidence and getting people to talk to oldsters. Seasons are changing. Pests are multiplying. The state of education in the US is appalling and getting worse, which is very sad. But no amount of electronic alternative universes can erase bee colony collapse disorder, the BP oil spill, the Fukushima disaster, and other signs of human hubris. Time to be careful to point out what is happening, rather than being careful to emphasize caveats. The unreasonable optimism that can say that Emanuel made his points well and the grandstanding accusations from the chair were self-defeating is not working. These falsehoods need to be debunked forcefully and publicly, over and over again. That would be the job for the likes of Andy Revkin – but I think he’s just tired of conflict and overworked – so we just have to hope that some youngsters like Kate at Climatesight will assume the mantle. No amount of boredom with the likes of SM and Dan H will stop them popping up like Mexican jumping beans. OAB, agreed, but one does not give up. I like words, so keep on fiddling with them while the world turns and burns. What is happening is that anti-science profiteers, bullies, and zealots are using science’s strength to defeat it. The quickness of the hand defeats the eye kind of stuff. Time to get weaving and find a “trick” just as effective at pointing back to the truth. Wordplay intentional, officers for the use of. I would be interested in hearing the opinions from academics related to the Research Excellence Framework (i.e. the replacement for the RAE) and the 20% for using research to impact on business, policy etc. Does this offer a new incentive to make climate science findings more relevant, or just to reward the practices that are already being done to apply research (or even disincentives to engage with “the public” in favour of specific “change makers” or something else?